The name of the IMAP provider setting is shown here. The value of the IMAP provider setting is shown here. Creates a new row. A setting can be entered directly or selected in the "Name" column. The value can be entered by double-clicking on the corresponding cell. Removes the setting currently selected in the list. 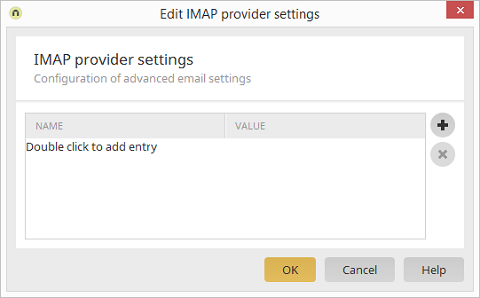 Information about the IMAP provider settings can be found here.